Can Project Based Learning, in itself, satisfy curriculum needs? The challenge with a PBL approach is in finding a balance between glossy, rich outcomes and a rigorous learning experience. Now, I’m not claiming to have solved this by any means, but I have found a neat compromise through which any ‘traditional’ scheme of work can be funnelled into a PBL framework, driven by outcomes. Essentially, the Project Portfolio is a list of written outcomes that, at some point, can be compiled into a portfolio of work. 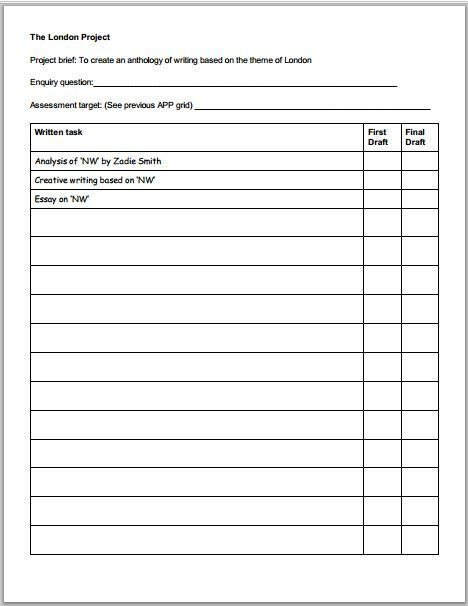 I’ve trialled this with a year 9 unit based on ‘London’, during which students were required to produce essays, descriptive prose, poetry, critical analyses etc, etc. In keeping with the PBL approach, the ticklist includes first and second drafts, making room for critique and redrafting. It sounds simple because it is. Essentially, using the portfolio approach allowed me to give shape to an otherwise disparate collection of tasks.